No problem I’ll see what I can track down. Ok, in the mean time I had another run through of your documents and the tvre.org site explanation of Auswanderung and Ausdamphverfahren. Seems very do-able to recreate these. However, is it me or does "Drawing 21. Rundschieber für Auswanderungsverfahren “B” " have crooked scales? 170 hm distance with 2.5 degree bearing change should show 24 nm/h (according to conversion factor 6000/1852) instead of 23. When I compare different marks each takes another value for meters per nautical mile. Same goes for Drawing 22. Not to German standards if you ask me. I agree. When I made my wheel used those images and I did notice that too, some results differed (albeit slightly) from the actual math. It must be an issue with the website creator’s scan. He appears to have had KM doctrine books in his possession and maybe the scan from the book was a bit distorted. I suppose one could recalibrate the wheel, that’s beyond my capabilities at the moment! Been using my excel file instead as my wheel needs some repair. At first I wondered if Germany adhered to a different nautical mile standard at that time. But there was a standard adopted in 1929 according to the wiki. And the other value for nm to km don't differ that much. So it's probably draftsman's error. I will just stick to the math formulas and make my own scales. 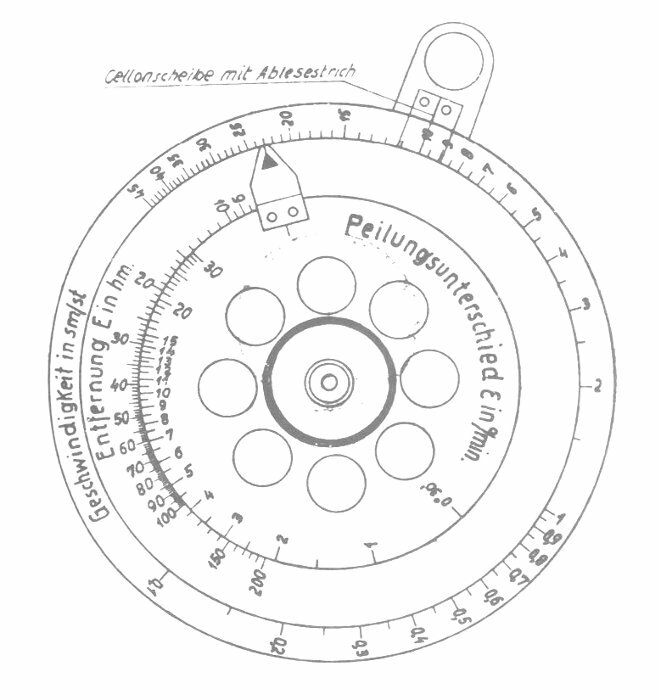 OK folks, another update to this file - I have added a tab for Ausdampfverfahren (method of calcing speed by achieving a constant bearing to target, then deriving target speed from own speed, that bearing, and AOB). I've been playing around with this method in WP while overtaking targets, and it works very well. 1. Note the exact bearing per the TDC to the 10th of a degree. 2. Note exact own speed to the 10th of a knot. 3. Estimate the ship's AOB. Input these values into the "Ausdampfen" tab and it will calc the target's speed. Obviously the initial AOB estimate will likely be inaccurate - as the approach unfolds, you will be able to refine his course and thus will be able to "go back" and adjust the initial AOB (and thus the speed estimate) accordingly. Last edited by derstosstrupp; 04-16-2019 at 10:06 AM. I would say, being at parallel course initially, reduce speed first with the 10 slower option of the EOTs. Then turn in to fine adjust to constant bearing. Else you turn in with a larger angle and close too quickly. I agree. I’ve been having success by first turning roughly parallel, dropping 1-2 EOT settings/10 slower until bearing barely moves, then fine-tuning course by turning 5-10 deg away at a time. You are right that the key is to reduce speed as much as you can to minimize the amount of course adjustments you do. Alright folks, more updates to this file! See Bearing Change file in my sig, and simply click File - Download As - Excel to save a copy for yourself. 1. A "how to use" tab detailing use from initial sighting to firing, step by step. 2. A Range Calculation section to tab 1 to compute range based on AOB, speed, bearing, and own speed. Purpose is to establish a plot by which to check initial estimates during overtaking. 3. An "attack disk" to tab 2 to allow the normal functionality of a hands-on one (derive AOB from course, and course from AOB, with the bonus of a lead angle generator for those diehards not wanting to use the TDC). Those are the main changes, but please read through the How to Use tab for how all the pieces fit together. I have been spending time solo recently testing this out and it works.